We are excited to welcome your kindergartner to Wilson County Schools! Parents/guardians who are registering a child for kindergarten are encouraged to attend the district's Kindergarten Registration Day held each spring. Mon., March 11 from 2-6 p.m.
Register your child at the elementary school serving the attendance zone in which you reside. Bring your child and all necessary documents to the school. See below. Children eligible to enter kindergarten must be 5 years old on or before Aug. 31, 2019. WCS also offers a Spanish Immersion Program at Frederick Douglass ES. 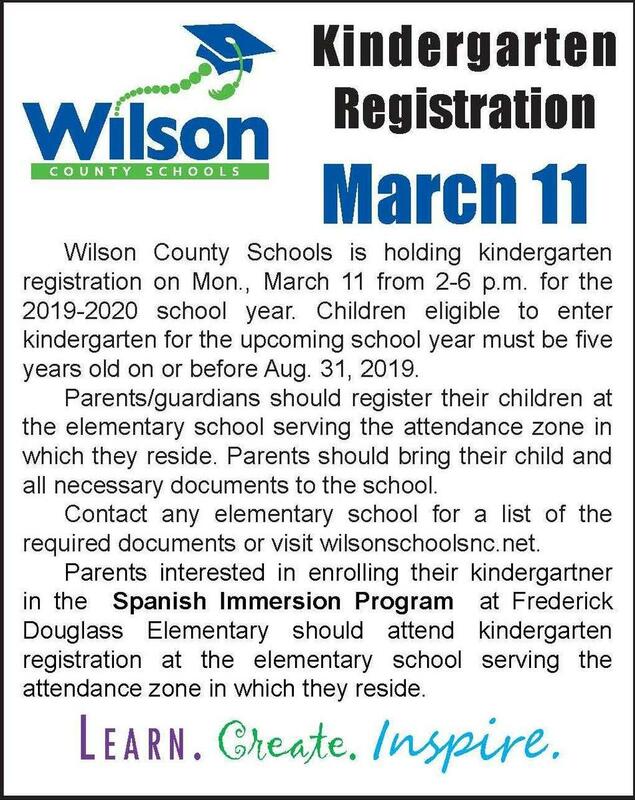 Parents interested in enrolling their kindergartner in this program should still attend Kindergarten Registration at the elementary school serving the attendance zone in which they reside. More information found here - Spanish Immersion Program Information. If you cannot attend Kindergarten Registration on March 11, you can register your incoming kindergartner at the school serving your attendance zone any time. - Immunization record printed from the doctor's office. More information about immunizations can be found here - Immunization Information. *Certified birth certificates may be obtained by writing the Vital Records Branch, 1903 Mail Service Center, Raleigh, NC 27699, by calling 919-733-3526, or by visiting the Vital Records Branch at 225 North McDowell Street (at the corner of Lane and McDowell). They may also be obtained from the Register of Deeds office in the county of the child’s birth. The charge for a certified birth certificate is $10.00 per copy from the Register of Deeds and $24.00 from the Vital Records Branch. These forms are provided by the school or can be filled out ahead of time by printing them from this website - Registration Forms. Please note that the Health Assessment Transmittal Form must be filled out by the child's doctor. Health assessments must be completed by the first 30 days of school. State law also requires immunizations for all children enrolling in kindergarten or first grade for the first time. As mentioned above, you will also need to provide a copy of your child's immunizations. More information about immunizations can be found here - Immunization Information.